“It’s a new lease on life in the Eastern Conference,” said Hall of Famer and TNT analyst Reggie Miller, who faced a similar situation when he played in the East during the era of Michael Jordan’s Bulls. But there’s intrigue beyond that, which rarely existed during James’ reign. Philadelphia finished strong in its first season with Joel Embiid and Ben Simmons playing together, and now might get a full one with 2017 No. 1 pick Markelle Fultz joining them after his shoulder problems last season. Any of them have a chance to get to the place that James wouldn’t let them. “An appearance in the finals is going to be sweet,” Embiid said. 1. 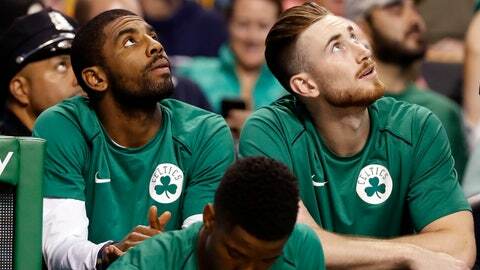 Boston — Depth of talent is not only tops in the East, but comes closest in the NBA to rivaling Golden State’s. 2. Philadelphia — If either Simmons or Fultz develops a jump shot to open things up more for Embiid, look out. 3. Indiana — Victor Oladipo has emerged as an All-Star and the Pacers are balanced behind him. 4. Toronto — If Leonard is fully healthy and motivated, Raptors added a top-five player to a 59-win team. 5. Milwaukee — Giannis Antetokounmpo is going to make the Bucks fun to watch in their new arena. 6. Washington — John Wall and Bradley Beal will give the Wizards plenty on the perimeter, but they need Dwight Howard provide a boost on the interior. 7. Miami — Heat won’t want to send Dwyane Wade into retirement without one final playoff appearance. 8. Detroit — A full season with Andre Drummond and Blake Griffin together should be enough to get the Pistons back into the postseason.